It looks like Adobe listened, and the image preview rendering that takes place as I develop photos isn’t noticeable anymore — that, or my faster laptop has something to do with it, too. However, the very noticeable lag in generating either standard or 1:1 previews still occurs as I browse through images in my catalog, and that can’t be helped even by my zippy MacBook Pro. As you move through images, Lightroom will blur them until it generates a standard preview, then blur them some more you zoom in, until it generates the 1:1 preview. Fortunately, there’s a solution for it. I’m not sure if this existed from the start, or if it was introduced in later versions of the software, but you can choose to generate 1:1 previews for a set of photos before you begin working with them. 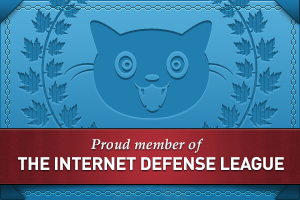 (I found this out thanks to this article from Steve Paxton at O’Reilly.) 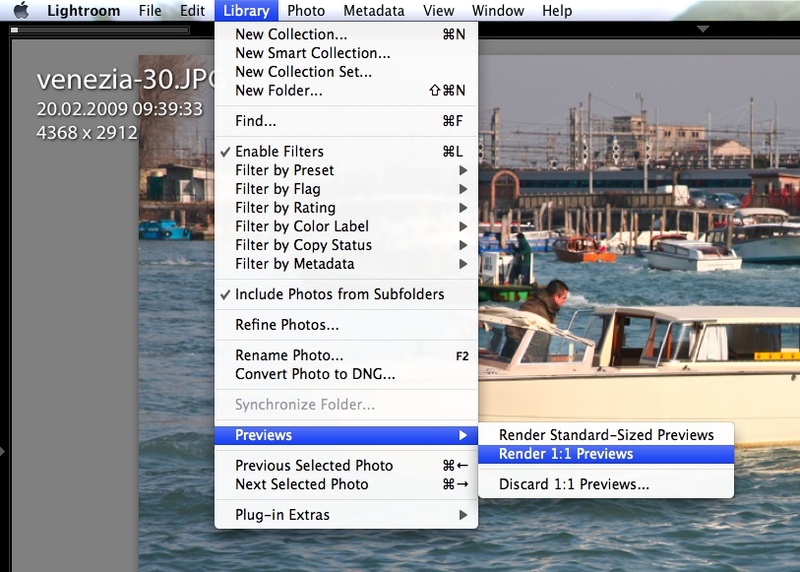 Just select the images you plan to work with on a given day, and go to Library >> Previews >> Render 1:1 Previews. If you choose that option, Lightroom will also render Standard-Sized Previews in addition to the full ones, allowing you to work with the photos right away, in standard or loupe view, with no lag or blurring (well, your computer’s specs might also have something to do with it). Still, if you’re sorting through a large set of images (hundreds or thousands), this pays off handsomely, in ways that you cannot even appreciate until you start popping aspirins to deal with the tension headache caused by all that screen blurring you could have avoided if you planned ahead. Guess what? Most readers just couldn’t get what I was saying. But Adobe listened. Points one and two have already been implemented in later versions. Now I can store my photos on multiple volumes, and I can work with their meta-data even when I can’t access the image files because I’ve disconnected the external drives. As for the the storage of the previews, that’s now easily solved, too. Because I’m now storing my Lightroom catalog on my laptop, where hard drive space is an issue, this means I have to limit the size of the previews database. I do this by giving it very little play. 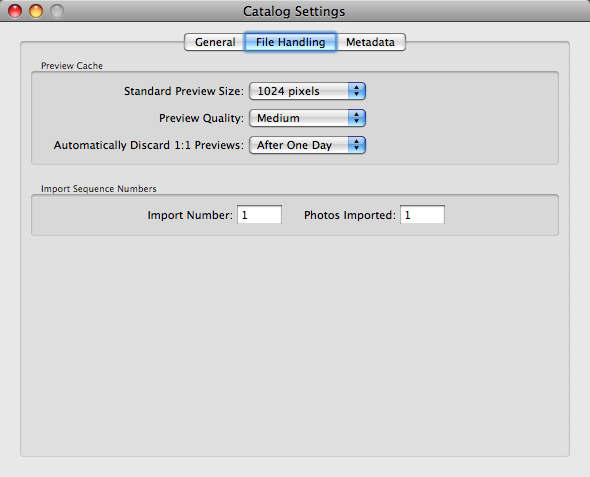 I tell LR to generate medium-quality 1024 px standard previews, and to delete 1:1 previews after a day. The previews database is no joking matter. Just a short while back, LR was set to discard 1:1 previews after a month, and my previews database had ballooned to over 60 GB! So, even though I allow myself the luxury of generating 1:1 previews for hundreds of photos, as you’ve seen above, the size of my previews folder stays manageable, and the free space on my hard drive stays where it needs to stay, because Lightroom cleans up after itself. Instead of worrying about free space, I allow my MacBook Pro to flex its processing muscle for 15-30 minutes before I dig into a large set of photos from a particular location, and then I can work undisturbed and headache-free for that day. To give everyone an idea how much space 1:1 previews take up compared to the image files they represent. I have ~11,500 RAW photos in my library which take up about 120GB on my HD and my previews folder is 28GB. Not bad on a 1TB HD, but this would dominate most laptop HD’s. One solution for laptop users is to keep your photos, library and previews on an external drive. I keep a mirror copy of all of this on an a portable USB HD. I keep it in sync using MS Sync Toy. I take this drive with me and my netbook when I travel. I then re-sync my photos with my workstation when I get home. True, this is workable now that 1TB portable drives are available for about $200. But say you’re on a trip, and you’ve been downloading your photos to the external drive, and it happens to fail. What then? When I’m traveling, I prefer to download the photos to my hard drive, and to back up my laptop to a 500GB portable drive with Time Machine. That way I have two copies of my photos, just in case. I’d take your advice about generating 1:1 previews on import, but in my case, I seldom work with the photos the same day or week after downloading them. I usually get to them weeks or months afterward. I’ll give you an example, and this is somewhat extreme, but normal for me, at least at this point — I’m just now getting to photos I took in 2007 and 2008 and processing/publishing them. I believe 1:1 previews have been in Lightroom since v1.0 I generate 1:1 previews on import for all of my photos. I keep them indefinitely, but I have a 1TB drive in my workstation an so far I have not had the need to start deleting old previews. I think I will now go check how big my previews folder is…..